When checking into a hotel at the beach, one of the first questions usually asked at check in is, do I have a water view. So the same question can be asked when dining at a restaurant that is on the water. You don’t have to ask that question at the Boathouse Canton. All tables have a view of the harbor. And since I have been there both day and night I can tell you the view, though looking at the same place, is totally different. There’s a more romantic feel at night. Something about twinkling lights in the distance. group. I say, and always have, let’s keep Baltimore restaurants owners local. Those from out of the area usually miss the key ingredients in keeping a restaurant open and popular in this town. Open seven days for lunch and dinner with a brunch Saturday and Sunday from 10 to 3, the Boathouse offers dining for about 175 inside and room for a private affair upstairs for about 60. Additional seating outside in season. If you go in season, always ask for an outside seat. Again, great views. The room closest to the harbor is The Terrace. It is enclosed so you can dine there year round. This time of year there’s free parking at an adjacent lot. But in the summer that lot is not free. There are 11 TV’s throughout so you wont miss your favorite sport. They tell me Happy Hour is seven days from 3 to 7 with reduced prices on appetizers and some drinks. 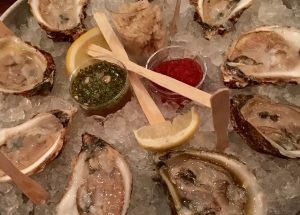 The menu offers a fairly wide variety of oysters. And that includes oyster shooters. You’ll also find gulf shrimp and steamed mussels on the starter menu. Salads include the boathouse chopped and caesar. Some of the listed entrees include the filet mignon ($29.50), grilled rib eye steak ($35.00) and the grilled rack of lamb ($34.00). For those who like trivia, I’ll offer this. The area known locally as Canton was named after Guangzhou China, where the language is Cantonese Mandarin. If you want to know why, ask someone else. Boathouse Canton is located at 2809 Boston Street. Reach them at 410-773-9795 or go to boathousecanton.com.